HOW DO YOU LAUNCH THE VENTURE OF YOUR DREAMS? Get Backed isn’t just about startup fundraising. It’s a handbook for anyone who has an idea and needs to build relationships to get it off the ground. Over the last 3 years, entrepreneurs Evan Loomis and Evan Baehr have raised $45 million for their own ventures, including the second largest round on the fundraising platform AngelList. In Get Backed, they show you exactly what they and dozens of others did to raise moneyeven the mistakes they madewhile sharing the secrets of the world’s best storytellers, fundraisers, and startup accelerators. They’ll also teach you how to use the friendship loop”, a step-by-step process that can be used to initiate and build relationships with anyone, from investors to potential cofounders. And, most of all, they’ll help you create a pitch deck, building on the real-life examples of 15 ventures that have raised over $150 million. Get Backed will show you exactly what it takes to get funded and will give you the tools to make any idea a reality. Evan Baehr is the cofounder of Able, a tech company committed to growing the fortune five million” small businesses around the United States with collaborative, low-interest loans. He’s worked at the White House, a hedge fund, and Facebook and is a graduate of Princeton, Yale, and Harvard Business School. Evan Loomis loves helping startups launch and raise capital, mentoring entrepreneurs through Techstars and Praxis. He heads up Corporate Strategy at Corinthian Health Services, and is the Founder of Tradecraft, a venture fund and consultancy for high growth businesses. His first startup was TreeHouse, a first-of-its-kind home improvement store specializing in performance and design. Evan also cofounded a national angel investment group called Wedgwood Circle. Evan got his start on Wall Street after graduating from Texas A&M University. He lives in Austin, Texas with his wife, Brandi, and their son, Ward. Is there a formula for raising a million dollars? This is the question that Evan Baehr and Evan Loomis tackle in their debut book, an insider’s manual for entrepreneurs who want to raise a ton of money — from startup founders, to small business owners, to Kickstarters. Where this book truly shines is in the “Actual Pitch Decks” chapter (page 73). These decks have raised well over $100 million, and the founders' commentary makes it feel like you're reading a secret playbook for successful entrepreneurs. Why struggle for years in the trenches, trying to get your fledgling startup off the ground, when you can raise all the money (and friends) you need to prosper? After reading this book, it seems much easier (and wiser) to do the latter. One of the authors tells a personal story about how he raised over $2 million in a month for his idea. Not his business… his IDEA. I shudder to think of how many of my own ideas never got anywhere, simply because I didn’t know how to raise money. Now I know. If you’re wondering how to take your Lean Startup to the next level, this book might just be the answer you're looking for. 26 pessoas acharam isso útil. 5,0 de 5 estrelasExcellent Beyond Fundraising! This book does much more than teach you how to get backed...I've worked in the private sector, federal government, and for non-profits, and this book is extremely useful to learn how to communicate and push big ideas in the most tangible way in each of those contexts. Since getting this book, I routinely find myself referring to it to guide me through my fundraising pitches for my non-profit and to help me define and communicate our core strengths amongst a crowded field of similar organizations. I'd recommend this book to anyone looking to improve their communication skills, sell better, tell better stories, design better graphics, improve branding, and influence others through their ideas. Even though this book should be a required addition to the syllabi of every business school, international affairs school, and journalism/mass communication school, students who use it to design their own presentations will stand out among the crowd. Great job on creating a simple, practical, and relevant guide to fundraising and beyond. 8 pessoas acharam isso útil. I'm an entrepreneurship educator who supports student entrepreneurs, and this text is the most thorough treatment of how to reduce a credible plan of action into a compelling pitch I've come across in 10+ years. While it provides the traditional pitch deck architecture you'd expect, it also contains valuable sections addressing: (1) the pitch deck slides you should have at the ready for the discussion you'll ave with potential investors, board recruits, and so on; (2) approaches to creating a narrative arc (origin stories, dramatic tension, etc. ), and (3) typography, slide layout, and color theory that build design skills. Highly recommend this book. Note, too, that while Chapter 2 is a free download, it's abridged and omits the "extra slides" an entrepreneur will want handy. With so many books like this having been written previously, my expectations were somewhat low that one could be written that would provide unique insights and a fresh perspective. I was wrong. First having bought the Kindle version, I consumed the raw content, but appreciated the book even more for its colorful charts when my sister gave me the hard copy. Evan Baehr and Evan Loomis have artfully developed a piece that should be used by any entrepreneur and even their advisers. Let's face it. Business plans are boring in the traditional 50+ page format. PowerPoint is now used to liven-up decks for pitches but most professionals lack the ability to develop the pictures that are "worth a thousand words". And, most decks either leave out the critical elements or drown audiences in far too many extraneous slides. This book offers structure, discipline and techniques. Not the only reference I would suggest - Guy Kawasaki, Brad Feld, Vinod Khosla, Sequoia Capital, and my professor, the late Jeffry Timmons have all written books and decks that one should use. But definitely you should add this to those esteemed VCs' guidance. 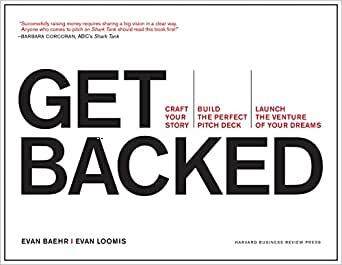 Get Backed has the dual advantage of distilling principles for successful fund-raising and also giving you an inside glimpse into the pitch decks of notable companies who have recently raised successful rounds. I can't think of a better way to get your creative juices flowing than to see the tools and techniques that other entrepreneurs have successfully used and to consider how they can be adapted to your startup as well. I have recommended the book to the co-founders of several companies I am invested in. I see the book becoming the "industry standard" guide for technology startups in particular.